The mobile app market is way past the infancy period and its market value is growing from year to year. The Gartner research statics shows us this trend. 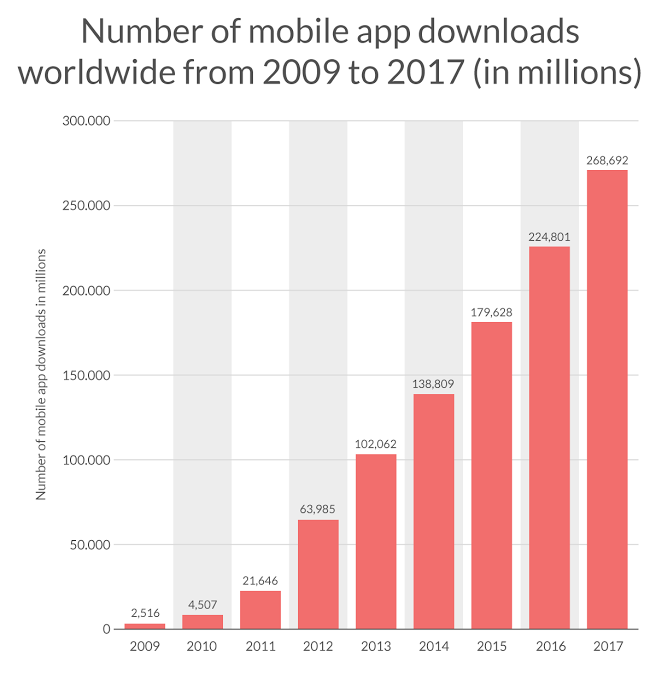 In the year 2009 a worldwide mobile app downloads amount was at the mark of 2.52 billion, and in 2017 it's 268.69 billion. That is why, if you have decided to create an app for your business or even to build a new business around your app, it is a right time. And we are here to help you with all the necessary information. So, you've got a great idea for an app, and you're ready to move on to the development stage. You're curious as to how much does it cost to develop an app? This article will give you some insight into what to expect when it's finally time to develop your app. If you ask a developer how much does it cost to build an app, you might be disappointed when they say they aren't able to answer. There's a good reason for that. The cost of making an app can be very different depending on app complexity and features. While some simple apps could take $20,000 - $40,000 to develop, others might start at $100,000 or more. On the other hand, mobile app development cost could be about $5,000 or under, but don't expect the same amount of special treatment in this case. You want to start by examining every aspect of the app you're looking to create. If you're going to reach out to a developer, you should already have a very clear idea of what the app will do, how it will work, how it will look and for whom it'll be. Is your app going to be available on iOS and Android? Or just iOS? Note, that iPhone app development cost is usually 10 or 15% higher than the one for Android. In its turn, Android app developments takes up to 10% more time. Will your app feature a shopping cart or a place to login? If you have all of these answers already in place, you can save yourself some time and app development cost when you reach out to the developer. Again, there are a lot of factors that go into pricing your app's development. All of the little details are carefully considered because, though they may seem small, they must be carefully and seamlessly implemented into your app. For the most part, it isn't as simple as clicking here and there and being done with it. There are services online that offer “app development” programs but these mostly just build on top of an existing framework. That means that, though it may be inexpensive, you're not going to have as many options when it comes to customizing your app. One of the best reasons to work with a professional developer is that you can take the time to meet with them (virtually or otherwise) and explain what exactly you are looking for. Since they will be working closely with you throughout the development process, you know your app is much more likely to turn out exactly as you imagined it would. This way, your app will be both high quality and unique, cornerstones for drawing attention to your business. This Is an Investment, But Is It A Worthwhile One? Think about the impact that your app could have if it brought in just a few interested leads per week. If you can, try and estimate how many customers it would take for you to make the money back that you spent on your app. If you expect a high ROI (return on investment) meaning you are about to develop apps that make you money, maybe it's worth spending a little more than you initially thought to make sure your app stands out. Or maybe it's worth the money and time it takes to make your app compatible with a broad range of platforms. Of course, feel free to ask your developers to chime in on this. Some development firms have marketing departments that can help you out. But maybe you're still not sure why the process is so costly. We've already gone through the questions and planning phase, so let's get into the actual development, shall we? What Follows the Planning Stage? The first thing the developer wants to create is an app prototype. It's a basic, functional and unpolished version of what the final app will look like. The idea behind the prototype is to be able to give you an idea of what the app will look like when finished and how it will work. This stage takes some time but is well worth it, and it usually starts with conceptualizing and drawing what the display will look like. If there's anything that you want to address now, you can do so before you run through the course of your development budget. This is also an important time to make sure that everything is working correctly so far and that the app will be executable and accessible to those who will be using it. You can even use this prototype as a test among a sample of your target audience and then get their feedback. By making the most of this prototype stage, you can be sure to get good value for your investment and save some cost of app development. Once the prototype has been thoroughly examined, and feedback has been received, the changes can now be implemented into the design. This process can go through a couple of stages. Every app developer wants to make sure that the result is precisely what their customer is looking for. So, don't be afraid to communicate with your developer to tweak the app's design, even if it takes a few rounds to get it right. You're investing your time and money, so make sure you're happy with the result. When you're happy with it, the developer fills in the rest of the blanks so that your app functions smoothly on the inside. They carefully program the app with coding that is reliable and clean. They integrate the services that you requested, whether you wanted a social media login page or an online shopping cart or user profiles. Throughout the process, they continually test your app to make sure that there are no bugs that might hinder your app's performance or cause it to crash. This is another time-consuming process but, just like the others, well worth it. It would be a shame to invest all that time and money into an app that winds up crashing right after your launch. The development team works hand-in-hand with the design team to bring your app together. 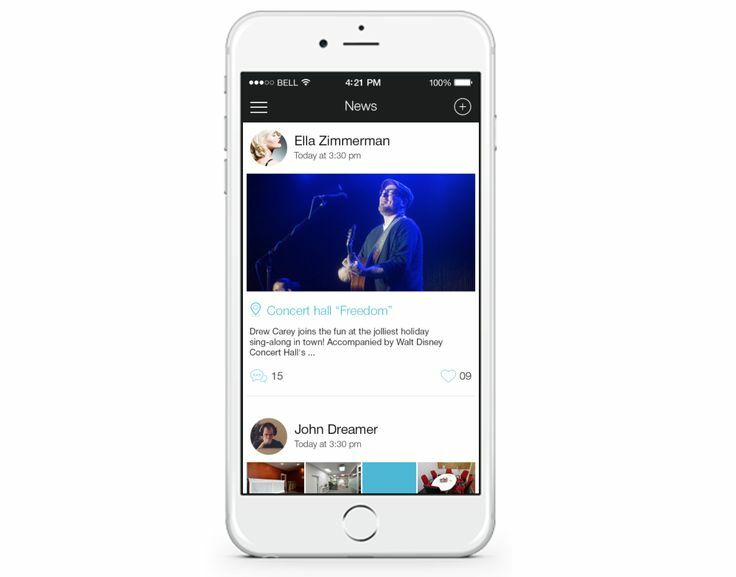 The design team is the one that sets up how the app will appear to its user. They prepare what kind of font you will see, what color scheme, the shape of the buttons in the app, the size of the search bar and so on. 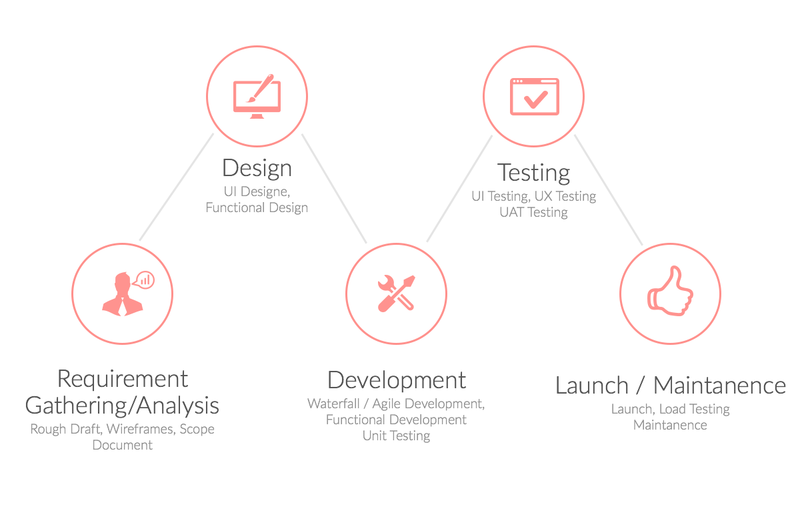 A perfect design would be based on trends in application development. The prototype may have a been a black and white blocky version of your app but, after the design team goes to work on it based on your instructions, they can transform it into a neat, colorful and engaging interface. During (and following) the development and design phases, there are usually a few revisions to be made to make sure that these two components blend seamlessly. Again, you don't want any bugs in your completed app, so it's a good thing that they continuously run tests and correct any inconsistencies. Between the amount of work put into this project and the number of hours worked, you can begin to see why the cost of mobile app development can be so high. Now that the app is a finished product, and you're happy with the result, it sure is a great feeling to see your app fully functional. It's just wonderful to think that your idea has popped into reality for all the world to see. You're ready for all the world to see it, aren't you? Releasing your app into a sea of other apps is like pouring a glass of water into a lake. You want to make sure your app gets noticed, and so, you're going to want to market it any way you know how. Some developers might help you with this phase (usually, these are firms with marketing departments). By reaching out to all of your network and your target audience, you can raise app awareness so that everybody knows about it. And then you hold your special release. Naturally, you'll want to stay on top of your app to make sure it continues to run properly by paying attention to crash reports and any feedback you hear from your customers. Congrats on the new app! So, how much does it cost to make an app? If you have already started to look for you outsourcing vendor, you probably noticed, that the price for app developers from the US starts from $50 and can reach the mark of $250 per hour. So, the price we offer is quite reasonable. Also, for your convenience, we have created an app cost calculator that helps you to estimate the approximate price according to features you need. Spend 5 minutes to get your project estimation. Want to create the best app of all time?